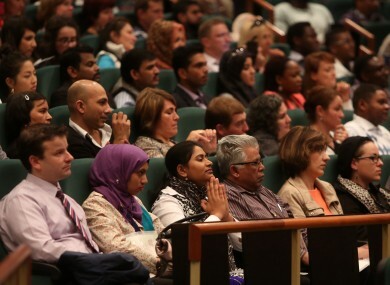 A citizenship ceremony in the Convention Centre Dublin. ONLY LUXEMBOURG GRANTS citizenship to a greater proportion of foreign nationals relative to its population than Ireland according to EU figures. Research from Eurostat shows that Ireland granted citizenship to 25,000 people in 2012. The EU’s statistical branch explaines that this translates to 5.5 citizenships acquired per 1,000 residents of the State. This rate puts Ireland second only to Luxembourg among the EU’s 28 member states with the landlocked nation granting citizenships at a rate of 8.7 per 1,000 of the population. The only other country close to Ireland and Luxembourg on that particular measurement is Sweden with a rate of 5.3. The average is across the entire block is 1.6 per 1,000 inhabitants. Luxembourg’s rate must be viewed in the context of Luxembourg having, by a distance, the greatest proportion of foreign nationals resident there. In Luxembourg, a massive 44% of the population is foreign born, meaning that a high rate of citizenships being granted would be expected. Ireland is above average in this respect as well with 2012 figures showing 11.8% of the population is foreign born. This is close to three times the EU average of 4.1%. Only Estonia, Cyprus, Latvia and Luxembourg have a greater proportion of foreign born individuals. As mentioned however, only the latter of the four grants citizenship at a rate greater than Ireland. The statistics also measure the frequency at which foreign nationals in a country are naturalised, with Ireland falling down the list on this particular measurement. This metric shows that, in Ireland, there were 4.6 citizenships acquired per 100 foreign nationals resident in the State in 2012. While Ireland may be second in the rate at which citizenship is granted on a population basis, relative to the number of foreign born residents here Ireland is seventh. This suggests that other countries are more efficient in how they deal with applications from foreign nationals. In this regard, Hungary has the greatest naturalisation rate at 12.8 per foreign nationals resident. Overall, Eurostat says that 818,000 people acquired citizenship of an EU member state in 2012. The vast majority of these (707,800) were to people born outside the EU. Email “Ireland grants citizenship to foreign nationals at a greater rate than every EU country bar one”. Feedback on “Ireland grants citizenship to foreign nationals at a greater rate than every EU country bar one”.